There's a lot more to District 9 than just exploding Tesla guns. Did you know one actor played all the aliens, plus some major scenes were improvised? We list the top things you should know about the new alien epic. One actor plays all of the talking aliens. It's only one actor who plays every alien, it's Jason Cope. He plays every single alien. Most, if not all, of the alien interaction and dialogue with Wikus during the eviction scene was improvised by Jason Cope or the actor Sharlto Copely (Wikus). But stuff like when he walks up in to the shack and says, "this is a gang sign, we're in a gang area right here," we would draw the sign on the wall and he would randomly say it's a gang area. And that meant because he's walking up to a shack that has an alien in it with a whole story that we've written with those guys distilling their fluid and I'm like, "that's interesting you just said that the supporting alien character is a gangster." But if it works, we keep going. The District 9 alien homes were actually shot in a recently evacuated area of impoverished housing. The homes you see the aliens getting evicted from were homes that humans had recently been kicked out of, for real. There was a very weird cross over between the film and the reality of filming. We filmed in an area called Chiawelo, which is a suburb of Soweto, which is sort of a suburb of Johannesburg. And there is this thing in Africa called RDP housing, which are government-subsidised housing. Where they will build you a brick house in a different area of the city. And you get put put on a waiting list if you're a South African impoverished resident, until you are able to get one of these houses. So the area we filmed the movie in, what plays as District 9, every single resident in that area was being removed to be put into RDP housing. Although not all of them had been given the green light on the RDP housing, most of them had, but all of them were going to be moved, whether they liked it or not. So we ended up with this open piece of land with all these shacks on it...each day we came to set, there were fewer and fewer people. 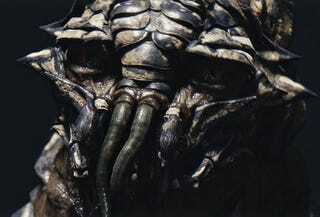 As you may know, District 9 was inspired by Neill Blomkamp's short film Alive In Joburg. But what many people don't realize is that he created Alive In Joburg's footage of people being interviewed about aliens, by using real interviews. The "Prawn" are from the Andromeda Galaxy. I think that they [the Prawn] do have a home planet, it's pretty far away probably in the Andromeda Galaxy, but what I like is that they'll live on the ship for thousands of years. Obviously, there's much more of a population on the main planet, but the ships will go out and get the minerals and the ore and whatever resources they need and then bring them all back home.